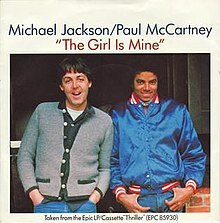 Han’s Worst Hits of the 80’s today is The Girl Is Mine- by Michael Jackson and Paul McCartney. The song was written and produced by Michael Jackson and Quincy Jones. Looking back it is hard to believe that The Girl Is Mine- was the first single off of Michael Jackson’s incredible Thriller album. There would be five other hit singles on Thriller- and all of them are superior to The Girl Is Mine. In fact The Girl Is Mine along with The Lady In My Life are the weak tracks on Thriller. It had to be the star power of Michael and Paul together as to why it was the first single from the album. A year earlier on a Paul McCartney album Paul and Michael had a #1 with “Say, Say, Say.” The Girl is Mine was a big hit -it went to #2. “Say Say Say” really wasn’t all that great I didn’t think but both Michael and Paul love those #1 hits so- it is easy to see why when MJ went to make an album why he would call in Paul for a song. The Girl Is Mine is lame, wimpy. McCartney and Jackson two great talents and this was the best they could come up with? I wouldn’t call this song irritating- or annoying a big disappointment and easy listening. LAME. There are certainly worse, more annoying songs but I don’t want to only hit on the minor artists who had fluke hits but the big stars- and do they come any bigger than McCartney and Jackson- when they release something this bad. I always worry when I see that subject line – Oh boy, he’s gonna get me again – but not this time. I’m with you on this one. Fun topic. Thanks. I’m totally on board with this one! I feel that every McCartney/Jackson collaboration is less than the sum of it’s parts. “The sound you make is Muzak to my ears”… John’s words ring true with this one. It’s like they were afraid to do anything daring while paired with each other. To give credit where it is due- I thought the Paul and Stevie song on Tug of War “What’s That Your Doing” was outstanding. The songs with Michael not so.. I totally agree with you here, as it’s a lame, extremely insipid song made all the worse by the fact it’s by two of the greatest songwriters and artists of that time period. I did like “Say Say Say” pretty well, though. The silly love song influence of McCartney dulled the musical impact of this song.